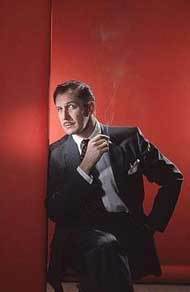 This Vincent Price photo contains business suit, suit, suit of clothes, well dressed person, suit, pants suit, and pantsuit. nice, but I wish it was larger. Unfortunately I have had the picture for a long time, so I have no idea where it came from. I just stumbled upon it in my photos. So I would credit it, but I just don't know it right now.